Nothing rockets a project to the top of the home repair priority list like a leaky roof. A recent severe rainstorm showed that the quick-fix tar patch I applied to the chimney/roof junction two years ago during a similar rainstorm had finally given out. Luckily the chimney is in the unfinished part of the third floor (attic) so nothing was damaged. Rather than patch it again I checked the weather (clear until Friday) and decided to do it right and reflash the whole chimney. These diagrams show the ideal system. What, you may ask, was I dealing with? Well, my house is over 120 years old, and let's assume that the last time the chimney was properly flashed (usually done when a new roof is put on) was 60 years ago. At some point it started leaking and homeowners added tar to stop it. Tar breaks down in UV light and then cracks. Water gets in the cracks and leaks through. Based on the tar buildup outside and the water stains on the rafters and chimney inside the attic, I'm guessing previous homeowners did the every two year quick-fix through the last half-century. 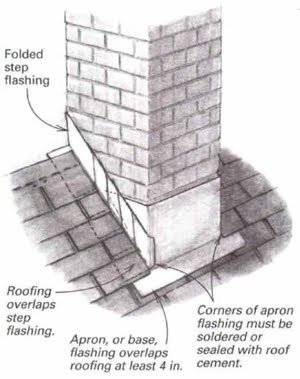 I don't have a photo of my chimney before I started working, but here is an example that looks similar, though not as bad as mine (courtesy of a very helpful site). Note that here you can see some of the counter flashing, but mine was totally covered in tar. On Sunday, I hacked off nearly 80 lbs of old tar, by my highly scientific guesstimate. The upper face of the chimney is only a few inches from the roofline, so there is a small valley there that collects debris, snow, and water. 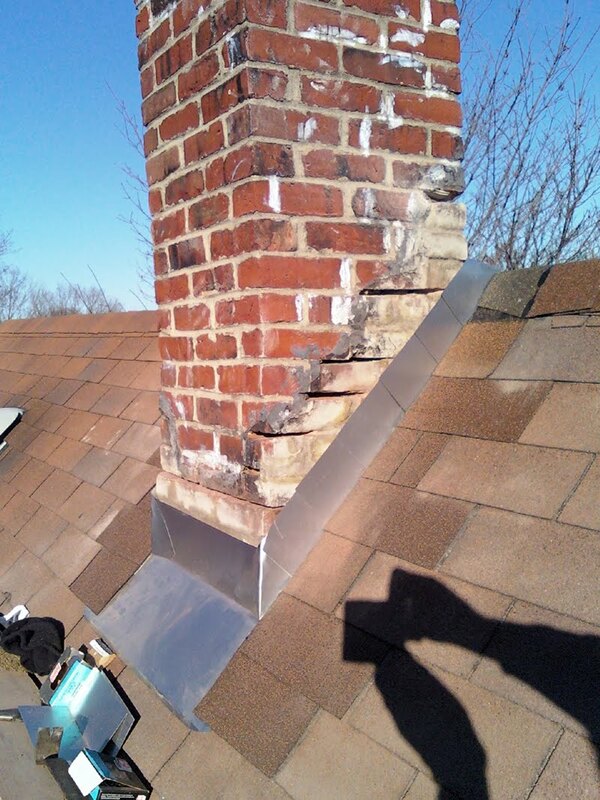 Instead of building what is known as a chimney cricket (basically a mini roof), previous owners simply loaded the valley up with tar so that it was nearly flush with the roof peak. And of course, it was full of deep cracks. On Monday, I took a half day from work and tuckpointed all the deteriorating mortar joints that I exposed after ripping off the old flashing. This was an unexpected problem I had to deal with, though not surprising. After so much water and so much time, much of the mortar was basically dust. I'm surprised the chimney hadn't collapsed. So this bump in the project was urgently necessary to keep the thing from crumbling as I worked on it. Tuesday, I was up on the roof at 8am, installing a small cricket that I had built the night before, and then I used the masonry blade on my circular saw to grind out the old lead counter flashing that I hadn't been able to remove with a hammer and chisel. I used aluminum for all the step flashing. It's very durable for the cost, and relatively easy to work with. For the counter flashing, I'll use lead. 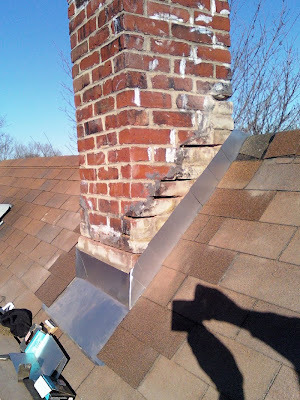 The first step was to fabricate the base or apron flashing (see photo) and then proceed from there up the sides of the chimney, weaving the step flashing and the new shingles (I had to rip up a bunch of shingles because of the tar). By the end of the day I had completed the step flashing, including fabricating an aluminum cover/apron for the cricket at the roofline, and finished all the shingling. Oh, and I was lucky that the previous owners had left a couple packets of matching shingles so I didn't need to try and match new ones to my roof. Here is what the job looked like near the end of the afternoon as the sun was getting low on the horizon. The channels cut in the joints will be filled in tomorrow morning when I embed the lead counter flashing with portland cement mortar. I'm using lead here instead of aluminum because 1) I need the flexibility of lead on the cricket because of some exposed seams in the base flashing, and 2) because aluminum corrodes when embedded in portland cement. Also, when the roof needs to be redone in 5 or 10 years, I'll be able to just bend up the lead to put in new shingles and step flashing. I'm not done, but the end is in sight, and I should easily be able to finish the job tomorrow morning. Yes, I know. Famous last words. Update: Everything worked out as planned -- see my follow-up post -- and through multiple rain storms and high winds, the attic has remained dry as a bone. ... so I came here looking for sociocultural commentary (Carnival) and I get a lecture on rebuilding chimney flashing? Now that's my idea of value-added! I also counsel patience. All good Objectivist Roundups come to those who wait. Actually, I'll get to it in a couple of hours, since my morning was spent finishing the counter flashing. For whatever this is worth, I have a slight technical disagreement with some terms used in that first graphic. Every time and always, any flashing that is UNDER, and is directed upward, is a type of counterflashing. Flashing, on the other hand, is always something that is directed DOWN, and is always laid over the top of the counterflashing. 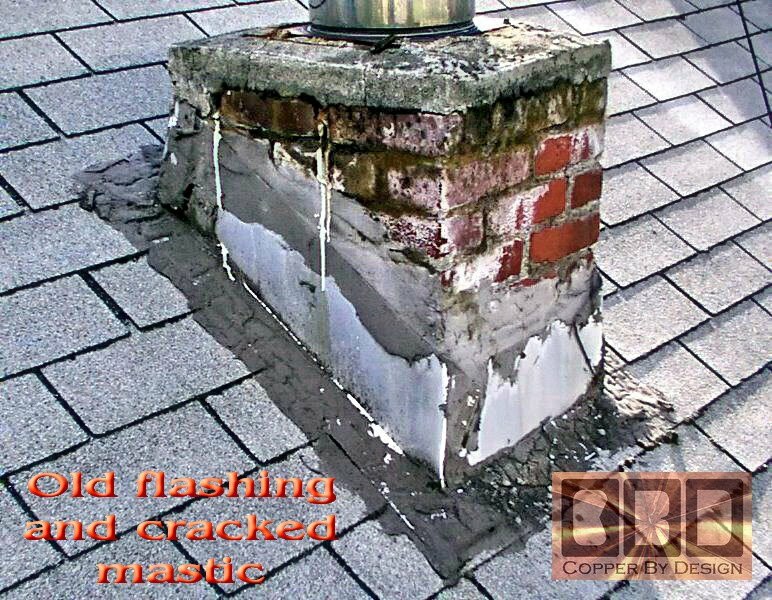 Your step flashing is the counterflashing to the top flashing that is directing water over it. Sorry if this is A) confusing in any manner, and B) it runs counter to your observed drawings, but they are just incorrectly labeled, period. You know, I wondered about that. The terminology didn't ever seem right to me, but every single article I read referred to it in the manner I described. This includes books and articles from Taunton Press, which you're probably familiar with. Based on your screen name, I'm assuming you're an architect. Do you think that the roofer's and mason's use of the terminology has become essentially a term of art, even though it is technically incorrect from an architectural standpoint? 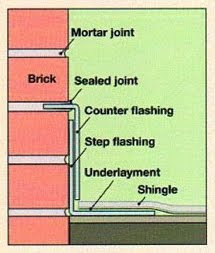 Could it be that they call the UNDER flashing "step flashing" because it steps up the roof woven with the shingles? And the DOWN flashing is simply opposite, or counter, to it? That's my guess for how the common but wrong terminology came about. Thanks for the clarification, regardless. AND I get a further discussion on roofing terminology! This is as good as hanging around a COOL workshop!